Psoriatic nail disease has many clinical signs. Most psoriatic nail disease occurs in patients with clinically evident psoriasis; it only occurs in less than 5% of patients with no other cutaneous findings of psoriasis. An estimated 10-55% of all patients with psoriasis have psoriatic nail disease, and approximately 7 million people in the United States have psoriasis. About 150,000-260,000 new cases of psoriasis are diagnosed each year. US physicians see 1.5 million patients with psoriasis per year. See the images of psoriatic nail disease below. Courtesy of Hon Pak, MD. 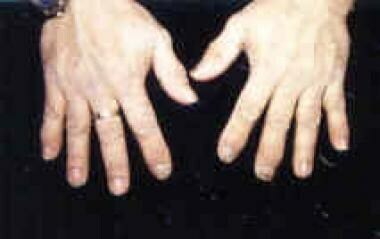 Classic distal interphalangeal joint involvement in psoriatic arthritis. This patient has extensive psoriasis, nail involvement, and joint pain. For patient education information, see the Psoriasis Center and Arthritis Center, as well as Psoriasis, Types of Psoriasis, Understanding Psoriasis Medications, and Psoriatic Arthritis. The pathogenesis of the psoriatic nail disorder is not completely known. Nail psoriasis may be due to a combination of genetic, environmental, and immune factors. A well-known fact is that a familial aggregation of psoriasis exists. Studies have linked psoriasis with certain human leukocyte antigen subtypes (eg, Cw6, B13, Bw57, Cw2, Cw11, B27). A T-cell–mediated inflammatory process is being investigated as part of the pathogenesis of psoriasis. 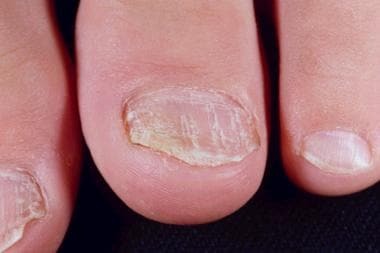 Psoriatic nail disease occurs in 10-55% of all patients with psoriasis, and approximately 7 million people in the United States have psoriasis (psoriasis affects 2-3% of the US population). Less than 5% of psoriatic nail disease cases occur in patients without other cutaneous findings of psoriasis. About 10-20% of people with psoriasis also have psoriatic arthritis, and nail changes are seen in 53-86% of patients with psoriatic arthritis. Psoriasis tends to run in families. In Farber's questionnaire study of 2100 patients,  36% of patients reported the presence of psoriasis in at least 1 relative. Among siblings, 8% are affected if neither parent has psoriasis. This percentage increases to 16-25% if 1 parent or sibling has the disease, and it reaches up to 75% if both parents are affected. If 1 twin has psoriasis, the other twin is at an increased risk of having psoriasis (25% for fraternal twins, 65% for identical twins). In Scandinavia, the prevalence rate of nail psoriasis for adults with psoriasis approaches 5%. The prevalence increases with the age of the population studied. Psoriatic nail disease is not associated with mortality. In severe cases, patients may have functional and psychosocial impairments. Males and females are affected equally by nail psoriasis, and the prevalence of nail psoriasis increases with the age of the population studied. Most psoriatic nail disease occurs in people with clinically evident psoriasis. The diagnosis of psoriatic nail disease without cutaneous psoriasis can be challenging because of the low index of suspicion and the lack of personal/family history of psoriasis. Choi et al sought to determine whether psoriatic nail features were associated with nail psoriasis or cutaneous psoriasis disease severity. Studies results indicated nail fold psoriasis and subungual hyperkeratosis were significantly associated with disease severity in both cutaneous psoriasis and nail psoriasis. The clinical findings associated with psoriatic nail disease correlate with the anatomical location of the nail unit that is affected by the disease. The nail unit is composed of the nail plate, the nail bed, the hyponychium, the nail matrix, the nail folds, the cuticle, the anchoring portion of the nail bed, and the distal phalangeal bones (see the images below). The nail plate is the largest component of the nail unit. The nail matrix gives rise to the nail plate. Any defect to the matrix results in onychodystrophy of the growing nail plate. The proximal nail matrix forms the dorsal portion of the nail plate, whereas the distal matrix forms the ventral part of the nail plate. The clinical presentation may vary depending on the location and the severity of inflammation of the affected nail unit. See the images below. 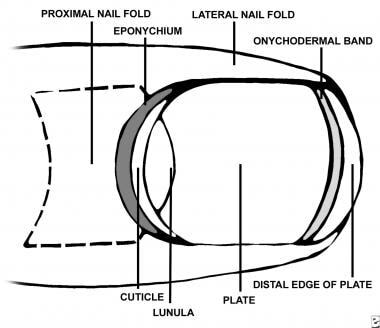 Anatomy of the nail, superior view. Anatomy of the nail, sagittal view. Pitting is a result of the loss of parakeratotic cells from the surface of the nail plate. These lines are transverse lines in the nails due to intermittent inflammation causing growth arrest lines. Leukonychia consists of areas of white nail plate due to foci of parakeratosis within the body of the nail plate. Subungual hyperkeratosis affects the nail bed and the hyponychium. Excessive proliferation of the nail bed can lead to onycholysis. Onycholysis is a white area of the nail plate due to a functional separation of the nail plate from its underlying attachment to the nail bed. It usually starts distally and progresses proximally, causing a traumatic uplifting of the distal nail plate. Secondary microbial colonization may occur. Nail plate weakening due to disease of the underlying structures causes this condition. Splinter hemorrhages are longitudinal black lines due to minute foci of capillary hemorrhage between the nail bed and the nail plate. This is analogous to the Auspitz sign of cutaneous psoriasis, which is the pinpoint bleeding seen beneath the psoriatic plaques. This is an erythematous patch of the lunula. Psoriatic nail disease may be due to a combination of genetic, environmental, and immune factors. A well-known fact is that a familial aggregation of psoriasis exists. Recent studies have linked psoriasis with certain human leukocyte antigen subtypes (eg, Cw6, B13, Bw57, Cw2, Cw11, B27). A T-cell–mediated inflammatory processing is being investigated as part of the pathogenesis of psoriasis. Other problems to be considered include idiopathic trachyonychia and punctate keratoderma. A nail biopsy is needed to confirm the diagnosis of nail psoriasis in some cases and is usually taken from the nail bed. Psoriasis can affect any part of the nail unit. Most changes occur in the nail plate. Histologic findings of nail psoriasis include mild-to-moderate hyperkeratosis, hypergranulosis, serum globules and hemorrhage in the corneum layer, papillomatous epidermal hyperplasia, and spongiosis. Many treatment options are available after the diagnosis of nail psoriasis is made. The treatments focus on improvement of the functional and psychosocial aspects of psoriatic nail disease. For preventive care, keep the nails dry and protect them from trauma to avoid the Koebner effect and possible secondary microbial colonization. In areas of onycholysis, the nail plate should be trimmed to the point of separation for medications to be effective. At present, no definitive and curative treatment has been agreed upon by medical experts. Discuss all treatment options for psoriatic nail disease with the patient, and choose the best individually tailored regimen. Topical 1% 5-fluorouracil solution or 5% cream applied twice daily to the matrix area for 6 months without occlusion improves pitting and subungual hyperkeratosis. Psoralen plus ultraviolet light A (PUVA) is very effective for cutaneous psoriasis and can improve nail psoriasis. Both oral and topical PUVA therapies have improved nail psoriasis in 3-6 months. A possible adverse effect of PUVA may be nail discoloration. Intralesional triamcinolone acetonide suspension of 2.5 mg/mL into the proximal nail fold is very helpful for nail matrix psoriasis (eg, pitting, ridging, leukonychia). This medication may be administered every 4-6 weeks. The proximal nail fold is sprayed first with a refrigerant spray for anesthesia, and the injection is given with a 30-gauge needle. Systemic therapies have been used in patients with severe cutaneous psoriasis. Few studies have shown significant improvement in nail psoriasis with long-term results. Certolizumab has been approved by the FDA for the treatment of plaque psoriasis, psoriatic arthritis, Crohn disease, ankylosing spondylitis, and rheumatoid arthritis. Approved dosing for moderate-to-severe psoriasis is 400 mg (two 200-mg SC injections) every other week. It is likely to possess class characteristics similar to those of other TNF-alpha inhibitors. Risankizumab is not approved by the FDA, but it can be used as monotherapy in adults with moderate-to-severe plaque psoriasis. When approved, the dose will likely be 150 mg given by self-administered subcutaneous injections at week 0 and week 4, followed by every 12 weeks. Avulsion therapy by chemical or surgical means can be used as an alternative therapy for psoriatic nail disease. Chemical avulsion therapy includes the use of urea ointment in a special compound to the affected nail under occlusion for 7 days, and the nail is removed atraumatically. Chemical avulsion therapy is painless, involves no blood loss, and is less expensive than surgical avulsion. Surgical avulsion therapy can be performed for psoriatic nail disease when other treatments have failed. During surgery, the matrix can be electively ablated to prevent regrowth of the nail. This procedure is performed under local anesthesia. Inform patients of postoperative discomfort, limitations, and possible physical nail disfigurement. Klaassen KM, van de Kerkhof PC, Pasch MC. Nail Psoriasis: a questionnaire-based survey. Br J Dermatol. 2013 Apr 1. [Medline]. de Vries AC, Bogaards NA, Hooft L, Velema M, Pasch M, Lebwohl M, et al. Interventions for nail psoriasis. Cochrane Database Syst Rev. 2013 Jan 31. 1:CD007633. [Medline]. Farber EM, Bright RD, Nall ML. Psoriasis. A questionnaire survey of 2,144 patients. Arch Dermatol. 1968 Sep. 98(3):248-59. [Medline]. Langenbruch A, Radtke MA, Krensel M, Jacobi A, Reich K, Augustin M. Nail involvement as a predictor of concomitant psoriatic arthritis in patients with psoriasis. Br J Dermatol. 2014 Nov. 171(5):1123-8. [Medline]. Balestri R, Rech G, Rossi E, Starace M, Malavolta N, Bardazzi F, et al. Natural history of isolated nail psoriasis and its role as a risk factor for the development of psoriatic arthritis: a single center cross sectional study. Br J Dermatol. 2016 Sep 2. [Medline]. Choi JW, Kim BR, Seo E, Youn SW. Identification of nail features associated with psoriasis severity. J Dermatol. 2016 Sep 7. [Medline]. Al-Mutairi N, Nour T, Al-Rqobah D. Onychomycosis in patients of nail psoriasis on biologic therapy: a randomized, prospective open label study comparing Etanercept, Infliximab and Adalimumab. Expert Opin Biol Ther. 2013 May. 13(5):625-9. [Medline]. Kouskoukis CE, Scher RK, Ackerman AB. The "oil drop" sign of psoriatic nails. A clinical finding specific for psoriasis. Am J Dermatopathol. 1983 Jun. 5(3):259-62. [Medline]. Handfield-Jones SE, Boyle J, Harman RR. Local PUVA treatment for nail psoriasis. Br J Dermatol. 1987 Feb. 116(2):280-1. [Medline]. Fredriksson T. Topically applied fluorouracil in the treatment of psoriatic nails. Arch Dermatol. 1974 Nov. 110(5):735-6. [Medline]. Feliciani C, Zampetti A, Forleo P, Cerritelli L, Amerio P, Proietto G, et al. Nail psoriasis: combined therapy with systemic cyclosporin and topical calcipotriol. J Cutan Med Surg. 2004 Mar-Apr. 8(2):122-5. [Medline]. Yamamoto T, Katayama I, Nishioka K. Topical anthralin therapy for refractory nail psoriasis. J Dermatol. 1998 Apr. 25(4):231-3. [Medline]. Bianchi L, Soda R, Diluvio L, Chimenti S. Tazarotene 0.1% gel for psoriasis of the fingernails and toenails: an open, prospective study. Br J Dermatol. 2003 Jul. 149(1):207-9. [Medline]. Scher RK, Stiller M, Zhu YI. Tazarotene 0.1% gel in the treatment of fingernail psoriasis: a double-blind,randomized, vehicle-controlled study. Cutis. 2001 Nov. 68(5):355-8. [Medline]. Cannavo SP, Guarneri F, Vaccaro M, Borgia F, Guarneri B. Treatment of psoriatic nails with topical cyclosporin: a prospective, randomized placebo-controlled study. Dermatology. 2003. 206(2):153-6. [Medline]. South DA, Farber EM. Urea ointment in the nonsurgical avulsion of nail dystrophies--a reappraisal. Cutis. 1980 Jun. 25(6):609-12. [Medline]. Maranda EL, Nguyen AH, Lim VM, Hafeez F, Jimenez JJ. Laser and light therapies for the treatment of nail psoriasis. J Eur Acad Dermatol Venereol. 2016 Aug. 30 (8):1278-84. [Medline]. Rigopoulos D, Gregoriou S, Daniel Iii CR, et al. Treatment of nail psoriasis with a two-compound formulation of calcipotriol plus betamethasone dipropionate ointment. Dermatology. 2009. 218(4):338-41. [Medline]. Tosti A, Ricotti C, Romanelli P, Cameli N, Piraccini BM. Evaluation of the efficacy of acitretin therapy for nail psoriasis. Arch Dermatol. 2009 Mar. 145(3):269-71. [Medline]. Syuto T, Abe M, Ishibuchi H, Ishikawa O. Successful treatment of psoriatic nails with low-dose cyclosporine administration. Eur J Dermatol. 2007 May-Jun. 17(3):248-9. [Medline]. Lawry M. Biological therapy and nail psoriasis. Dermatol Ther. 2007 Jan-Feb. 20(1):60-7. [Medline]. Brown T. Fingernail Psoriasis Data Added to Humira Prescribing Info. Medscape News & Perspective. Available at http://www.medscape.com/viewarticle/877985?src=soc_fb_170405_mscpedt_news_pharm_humira. March 30, 2017; Accessed: April 6, 2017. [Guideline] Menter A, Strober BE, Kaplan DH, et al. Joint AAD-NPF guidelines of care for the management and treatment of psoriasis with biologics. J Am Acad Dermatol. 2019 Feb 13. [Medline]. Disclosure: Received none from Amgen for consultant & investigator; Received none from Novartis for consultant & investigator; Received none from Pfizer for consultant & investigator; Received none from Celgene Corporation for consultant & investigator; Received none from Clinuvel for consultant & investigator; Received none from Eli Lilly & Co. for consultant & investigator; Received none from Janssen Ortho Biotech for consultant & investigator; Received none from LEO Pharmaceuticals for consultant & inves. Fast Five Quiz: What Do You Know About Psoriasis?